How’s your upper body strength? 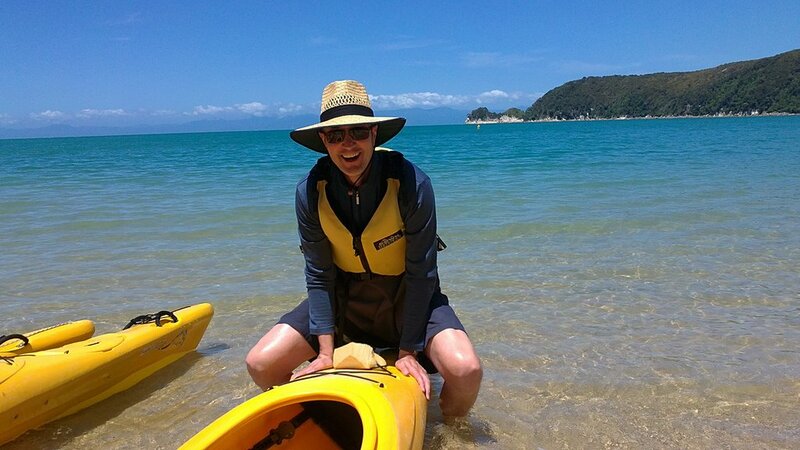 If its not too bad, then a kayaking Abel Tasman NP (National Park) is definitely recommended. 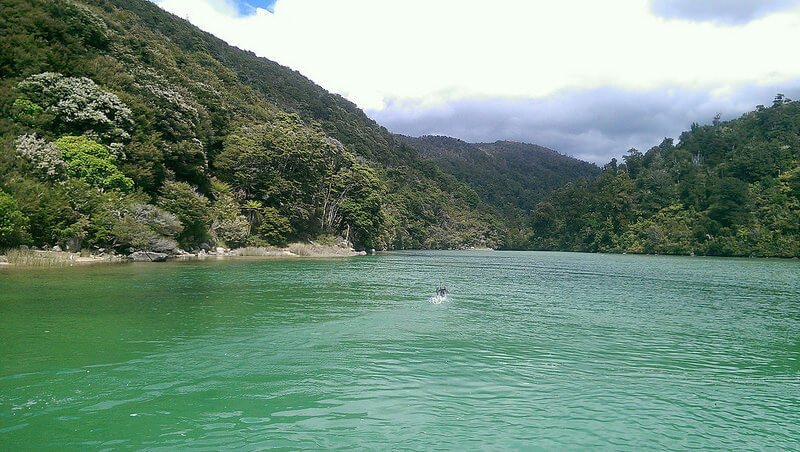 The Abel Tasman National Park is a real stunner for scenery. You get it all – turquoise waters and gorgeous native bush. 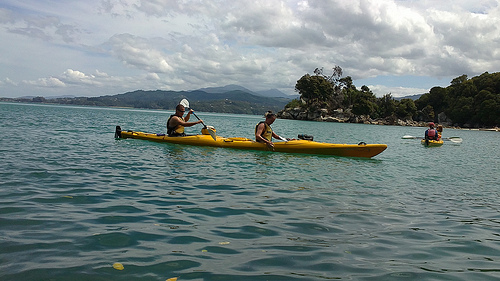 With this Kayak trip, everyone meets at Marehau Beach.From there, everyone gets into the water taxi. A farm tractor will then two the water taxi out into deeper waters. It really is a weird sight to see all these tractors churning back and forth through watery pastures. 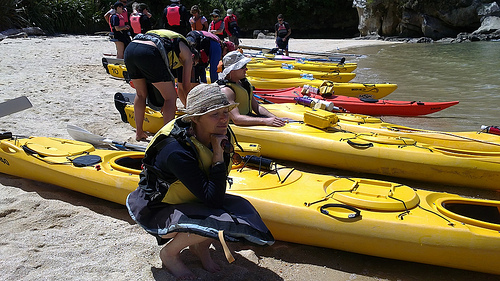 Sea Kayaking Abel Tasman National Park – sea & beaches! There are so many beautiful golden beaches dotted around the Abel Tasman region. The water taxi lands on one of these beaches and that’s where our kayaks are waiting. Also waiting for us, is a great guide. The guide gets here priorities right and immediately hands out our lunch packs. “Who’s the gluten-free”? “Whose the vegetarian”? and “Whose kinda normal”? I had ordered the gluten-free lunch and it was really tasty – a couple of filled egg rolls, a gluten free almond slice and a crunchy apple. Sitting around at lunch, its a good chance to get to know the group. We still find it pretty alarming to see visitors showing a lot of skin. Our sun in this part of the world is very strong, so it pays to cover up a little more and apply plenty of sunscreen. 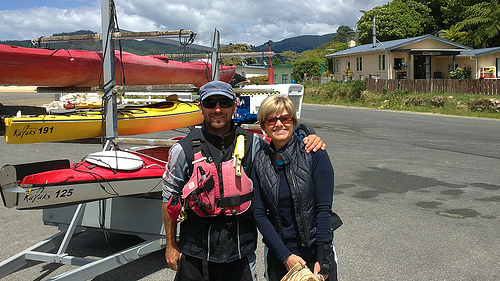 Lifejackets and the ‘skirts’ to clip onto the kayak are all supplied. The ‘skirt’ is actually an all-in-one lifejacket that hangs from a pair of braces. This serves to fan out into a skirt shape. It’s the skirt bit that you tuck around your seat in the Kayak. Its a great way to prevent anyone getting too wet. It does remind me of a toilet seat. I wonder if anyone’s thought about that before. On all these trips, the guide spends quite a bit of time on explaining safety procedures. Everyone needs to understood how to cope in an emergency situation. The guide gives you a gentle push into the water and suddenly you’re gliding through sparkling waters. You’ll actually float away from the shore very quickly, especially if you get a tailwind. It’s all incredibly calming to hear the gentle lap of water against the kayak. And of course there’s the ever-present birdsong. This is the habitat of the ‘others’ – birds and creatures who don’t seem to notice our presence. Its quite a sight to see Shearers plunging vertically into the sea to catch the fish-of-the-day. And who wouldn’t be thrilled to see a cute little blue penguins backstroking by. There are many people that only get to see this sort of stuff in books or videos. To actually be witnessing it firsthand is pretty darn special! Don’t worry if you get a little tired. No one gets left behind. The guide is constantly checking to see that everyone is keeping up. Although if you’re sharing a kayak, you are expected to take turns, if one of you needs a break. Now and then we paddle through beautiful narrow channels. These channels are not accessible unless you’re in a kayak. They’re incredibly beautiful areas with overhanging rock sculptures and plants. The sound of silence is golden. It sure cleanses the mind. In this photo you can see quite clearly the little water-proof security box for cellphone and wallets. This fits very tightly under strong elastic cords on top of the kayak – its always within easy access for photo-shoots. How I managed to take this photo and still remain upright, will remain a mystery. But these kayaks are very sturdy. 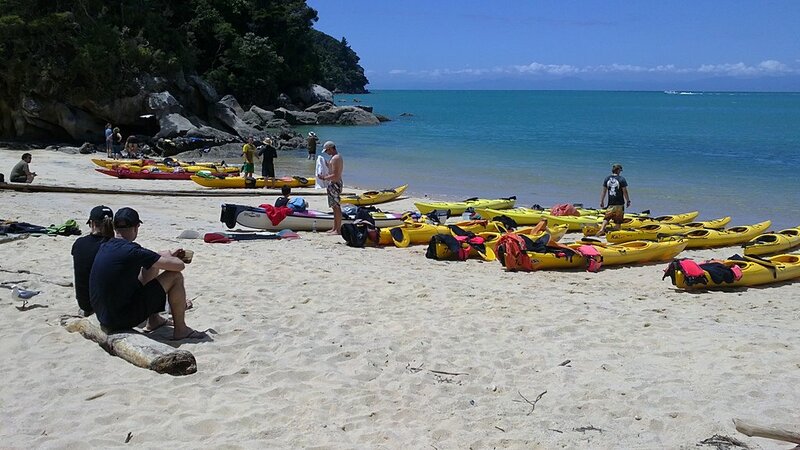 When you’re Kayaking Abel Tasman NP, you won’t every be too far from Marehau Beach. But its amazing how deceptive distances can be when you’re in the water. Twenty minutes can go by and you don’t seem to be getting any closer. Then all of a sudden, you’ll notice that the few houses dotted around are looking more defined. Do you get wet? Yes, you do, but it’s not enough to make you uncomfortable. 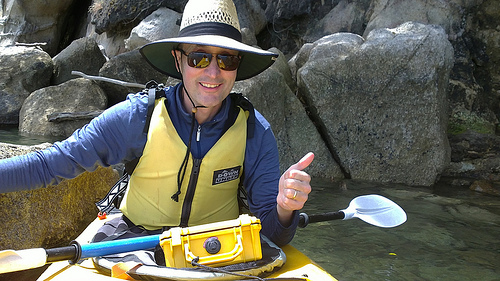 Also there are sponges at the front of the kayak. You can use these to wipe any excess water that happens to pool around your ‘skirt’. One minute you’re floating through unfathomable depths and the next you’re in the shallows. Honestly, it happens that fast. I’m thankful to see the Abel Tasman Kayaks van waiting to pick us up. Good timekeeping at the right end guys. Don’t be surprised if you are expected to muck in and rinse your own life jacket. You will be expected to assist with lifting the kayaks onto their racks back at base camp. Its actually quite a nice feel-good way to end this lovely Kayak trip. 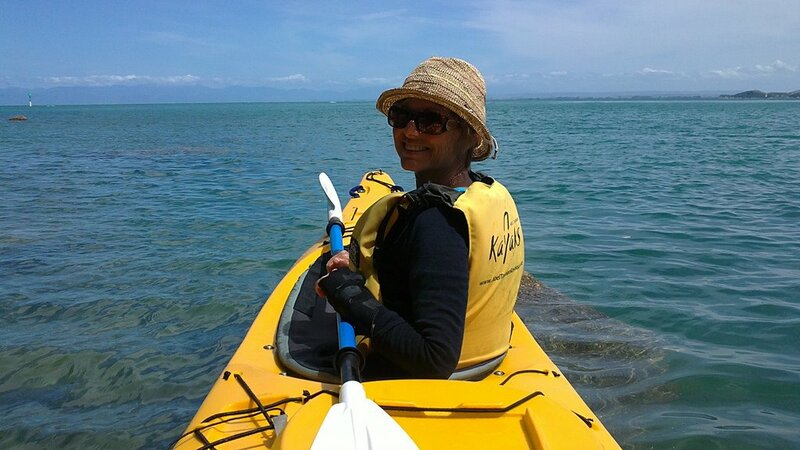 If kayaking is not your thing you may want to try Abel Tasman Eco tours or Abel Tasman Charter. In any case the region is stunning for holiday makers. Also, some accommodation options for your consideration. 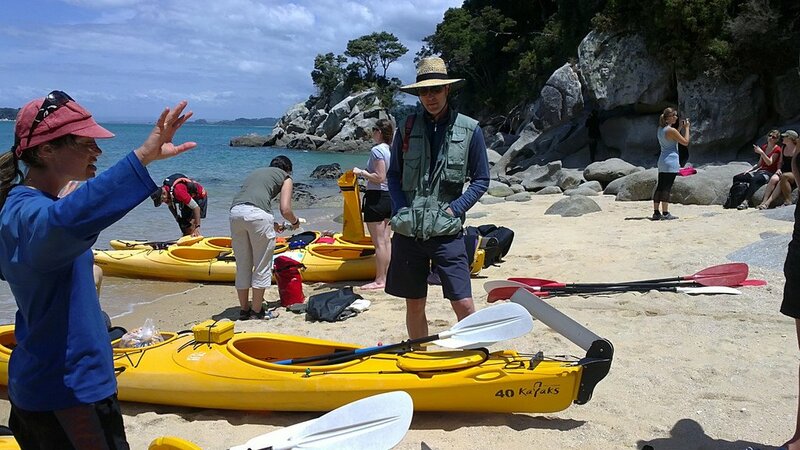 Happy travelling with Kayaking Abel Tasman National Park!